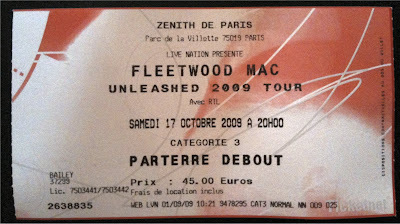 Last night was our 6th concert in Paris: Fleetwood Mac at Le Zenith, which included Stevie Nicks, Lindsey Buckingham, Mick Fleetwood, and John McVie. Le Zenith is located in the 19th arrondissement, in the extreme northeast part of Paris on the grounds of La Villette park, the largest landscaped park in Paris. The concert was scheduled to start at 8p but we (Amanda, Christina, Angela, Kent and myself) had dinner with Alex and Andrea (who had just returned from Japan) at Les Fountains near the Pantheon, not far from our apartment. We figured if we left the restaurant at 7:30, we could get to the concert just in time. I'm not sure it's possible to complete a meal for 7 people in 90 minutes in a decent restaurant in Paris. So, while the dinner and company were great, we didn't leave the restaurant until 8p and had a minimum 30 minute metro ride to the grounds of the concert. Of course, as fate would have it, the metro line we chose ended prematurely, halfway to our destination. Apparently, all stops after Republique were inactive due to repair work so we had to disembark and re-route through a couple other lines which eventually got us to the park a little before 9p and it took us almost 15 minutes to find Le Zenith, where we had floor standing tickets. I had 6 tickets but because one of Christina's friends couldn't make the trip to Paris, I had an extra which I thought I would sell at the arena but arriving late made that difficult. Fortunately, some lonely scalper offered me 10 EUR just as I arrived, which I quickly and happily scooped up. 10 EUR is better than nothing although the tickets were 45 EUR. 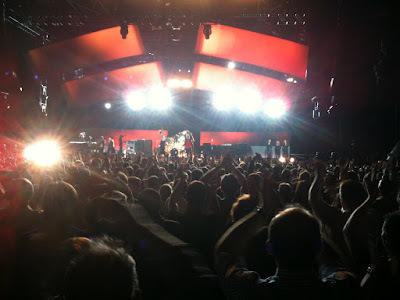 Le Zenith only holds 6,000 people which I thought absurdly small for a group the stature of Fleetwood Mac. Coldplay sold out 50,000 seats at Parc de Prince. Green Day sold out 20,000 at Bercy. Surely Fleetwood Mac has their status, no? I guess Fleetwood Mac is just not that well-known or popular in France. In any case, we arrived a little after 9p and the band was already playing. I didn't know if there was an opening act so I wasn't sure how long they had been on stage. However, from some of their remarks (Buckingham: "so glad to be back in Paris after 20 years", Nicks: "Last time I think we were drunk. I was coming back to Paris if I was going to stand on a street corner and sing"), it appeared they hadn't been playing long. While we were at the back of the floor, we were still much closer than in Charlotte. 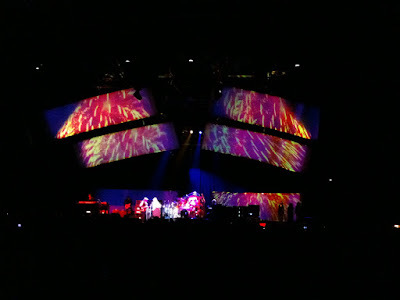 Le Zenith was designed first and foremost as a concert arena so it has good sight lines and sound but it was still a little strange seeing Fleetwood Mac in such a small setting. The stage set and lighting were minimal compared to the concert in Charlotte and the crowd was definitely older. They played till almost 11p, including the encores, giving us almost 2 hours of music so I don't think we missed too much of the early part of the show. The last song they played was one of their most enduring, Don't Stop. Unfortunately, the keyboard player ran into some technical problems, causing them to restart the song twice (after a technician came on stage to fix the problem), which prompted Stevie Nicks to lightheartedly say something like: "If this was an acoustic band, this wouldn't happen. But as soon as you plug something in, you have these kinds of problems." As was the case in Charlotte, Lindsey Buckingham was really the star although Nicks' voice is the signature of the band. It was their addition in 1975 that changed the band from blues to pop rock and launched their stardom when I was in high school! All in all a good show but I was a little scattered due to the hectic schedule getting there and didn't feel too motivated to take a lot of pictures or record any audio/video as I've done with earlier shows so I mostly just enjoyed the show. well... you're wrong about the "last" song... it was "Silver Springs"... and the song that they had technical problems with was "Stand Back".... other than that, you got it all right! It was a GREAT show!!!! I'm pretty sure "Don't Stop" was the technical problem because we left after that. So I missed 55 minutes huh? Crap. When we arrived, they made comments that were typical of post-opening song comments. I remember hearing all of Rhiannon so I think we walked in on the 6th song.